Description The database chart shown above was drawn with RFFlow using the Database Design Stencil. This database has three tables, Employees, Dependants, and Department. In the Employees table, the primary key is the Employee ID. The other fields are the usual name, address, etc. Each employee may have several dependants, so the Dependants table has a many to one relationship to the Employees table. The Employee ID relates these two tables. A database with multiple tables that are related is called a relational database. A department will hopefully have many employees so the Department table is related to the Employee Table in a one to many relationship using the Department Code. The Department Code is the primary key in the Department Table. The Department Code is not a primary key in the Employees table so it is referred to as a foreign key and labeled differently. The chart above also shows some index fields. These are used if you regularly sort data in tables by the same field. It speeds up searches. This database chart uses a modern set of symbols. RFFlow also includes the traditional symbols used in drawing database diagrams. If there are any symbols that we don't have, contact us and we can add them in the next RFFlow upgrade. Once RFFlow is installed, you can open the above chart in RFFlow by clicking on new_database.flo. From there you can zoom in, edit, and print this sample chart. It is often easier to modify an existing chart than to draw it from scratch. To draw this chart without downloading it, run RFFlow and click on the More Shapes button. Scroll to the Database Design stencil and click on it. Then click the Add Stencil button. 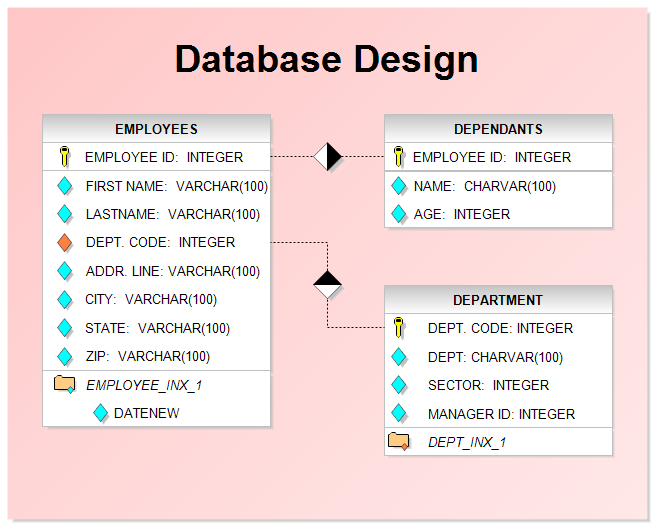 Click on the gray shaded box in the Database Design stencil and type in the title of the table. Then click on a white box and type in the names of the fields, clicking the ENTER key on your keyboard to go down one line for each field. The diamonds and folders are separate shapes that are added on top of the text boxes. Lastly add the background color and size it around your chart. To size a box, click on it and adjust the green handles. The title can be added by clicking on the word "Text" in a stencil and making the font larger.